As a huge fan of Ally Carter’s other two series (The Gallagher Girls and Heist Society), I had high expectations coming into All Fall Down. Not only were they met, but they were exceeded. All Fall Down is very unique in that it is told from the perspective of Grace, who is clearly struggling with some mental health issues after witnessing the traumatic death of her mother. Living with her grandfather on Embassy Row is supposed to give Grace a fresh start, but Grace is unable to move on past her mother’s death and quickly draws some of her new friends into the search for the killer. I enjoyed All Fall Down for a few reasons: First, it gives an incredible look at the struggle and strength that mental illness holds in a way that was relatable and had my heart breaking for Grace multiple times. Second, it takes place in an exceptional setting. Living on Embassy Row requires children to put aside their desires for friends and fun to consider national and international diplomacy. It adds an additional layer of caution and danger to Grace’s story. Third, Ally Carter’s writing is exquisite. There were quotes that had me cringing in disgust or wincing with the pain of the characters. One of the most incredible images came from the fact that I was able to clearly visualize the moment that Grace’s mother died; what made this different from so many other books is that it developed throughout the story as bits and pieces came back to Grace, so my visualization of the scene changed at the same time as Grace’s. Grace is also not your typical female character. She is strong and determined to figure out what really happened the night her mother died. Grace is also scared and hurt by everything that has transpired, and yet she stands up for what she believes in, no matter the consequence. While her determination may lead to some undesirable diplomatic events, it is inspiring and encourages the reader to be cheering her on the entire time. Ally Carter keeps the reader guessing up until the very end. There were so many twists and turns that I didn’t see the ending coming. There are times when I feel this can be an overdone strategy but in this book, it works. I was engaged and curious to know what would happen next the entire time. I wouldn’t say we’re left with a cliffhanger, but it’s pretty darn close! 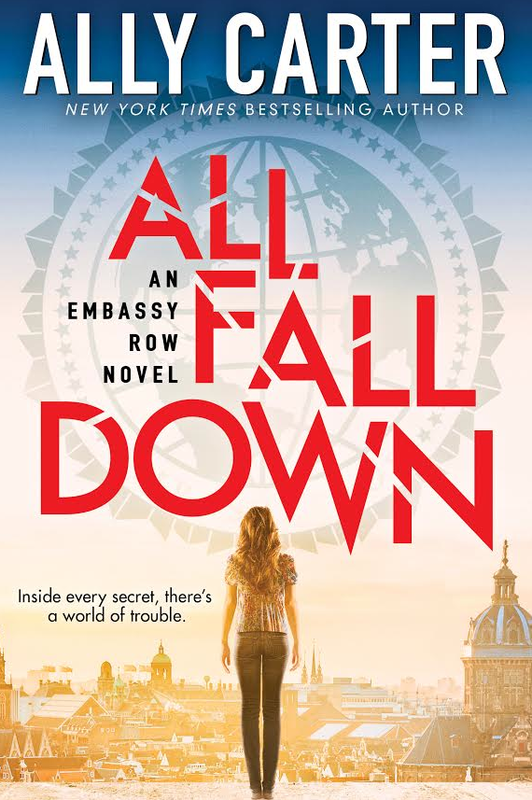 I am eager to learn more about the world of Grace and Embassy Row and am very much looking forward to the second book in the Embassy Row series. Check out All Fall Down when it hits stores on January 20, 2015! Thank you to Scholastic and Ally Carter for the ARC.